Braised Pork – This is our classic slow cooked pork shoulder that partially put us on the map. Topped with our original slaw it becomes almost super-hero-like. Bacon Chorizo – A Mexican-style chorizo made entirely of hand chopped bacon. No pesky fillers, just bacon bacon bacon. Bul Go Gi – This is the famous Korean BBQ Beef done up Tacopocalypse style. Marinated sirloin topped with Kimchi and spicy mayo. Vegan Chorizo – The other flavor that put us on the map. This is our house made all-vegetarian sausage made with textured soy protein, minced veggies, tomatoes, and my special chorizo spice blend. Poblano Potatoes – Cumin Roasted Potatoes paired with fried onions and Poblano Peppers, topped with “White Girl Sauce” (Adobo Crema) and spicy slaw. Yes.Please. BREAKFAST THING!!!!! What is it? Two corn tortillas with melted Chihuahua cheese in the middle topped with scrambled eggs, your choice of our above taco flavors, and the corresponding slaw/sauce for whatever flavor you choose. You get to dress it with your choice of salsas, fresh jalapeños, cilantro, and onion. It has become a staple of many people’s Farmers Market dining, you should give it a try if you haven’t already…but if you have then you probably didn’t bother reading this since you already know what’s up. word. Sides!!! Did you know that you can get a side of Poblano Potatoes for $2? Well you can, and it is a perfect compliment to your tacos or Breakfast Thing. Big Time. We will be at our usual Taco Haunt (2nd Ave, just south of Court Avenue, on the East side of the street) from 7 am until Noon! And while you are there don’t forget to stop by and pick up some produce from Cleverley Farms around the corner. We love his produce! 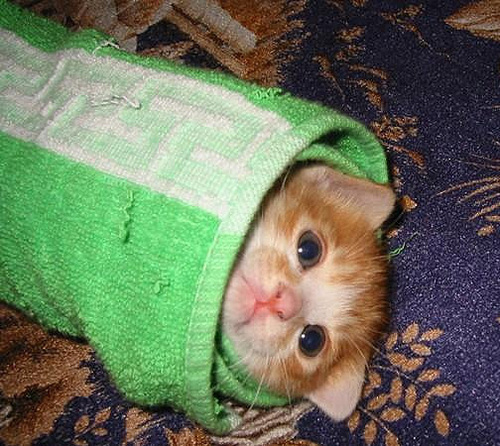 Burrito Cat is t3H @w3s0Me!